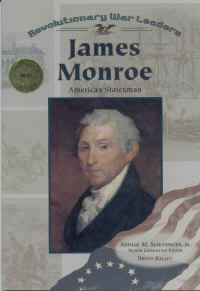 BR> When James Monroe was just seven years old, he heard something that changed his life. His father and uncle were talking about new laws from Britain. They thought the laws were not fair. From then on, James love politics and wanted to help his country become free. At 18, James became an American soldier. He fought in many battles and was wounded. But once America won its freedom, James wanted to keep on helping his nation. He worked for both Thomas Jefferson and James Madison when they were presidents. Then James became the fifth president of the United States. He worked all his life to keep America free. This new book is from a book store and may have our price sticker on the back. It has some shelf-wear on the outside and is new. We ship next business day after you order and send you shipping/tracking number!